When Market Operations, the brand behind Altrincham’s award-winning market, decided to launch a new venue they called on Dawnvale for help with the fit out. The Grade II listed Mackie Mayor building is one of the two remaining original buildings from the former Smithfield market on the edge of Manchester’s Northern Quarter. Dawnvale helped to transform this iconic space into a buzzing urban venue for some of the city’s brightest new food and drink operators. With 10 bustling food and drink operators serving up their goods in a single space, efficient and speed-focused kitchens were a must. 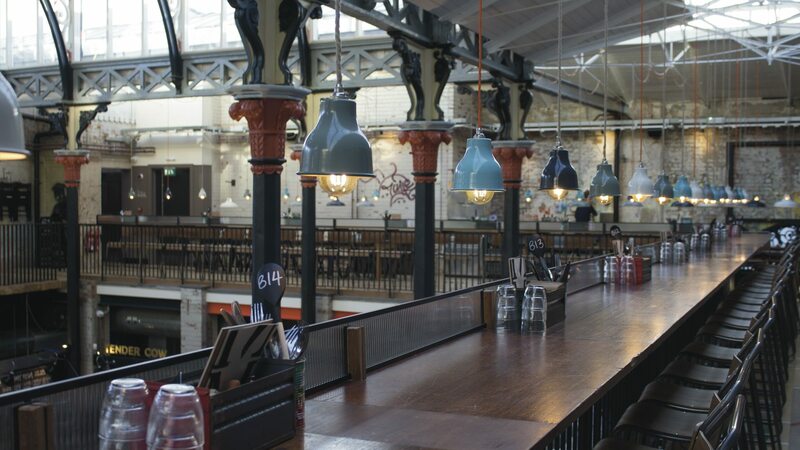 We supplied and installed bespoke commercial kitchens around the outside of the main space. We began the project in January 2016, designing, creating and installing a bespoke odour control and extraction solution that would allow multiple operators to cook and prepare food in the space without overwhelming customers. The commercial kitchens in the Mackie Mayor building have to function perfectly and make the right impression on an aesthetic level - they’re all visible to customers, so appearances really do count. Behind the scenes, vast quantities of fresh and dry goods need to be stored neatly, efficiently and hygienically. We created a number of cold rooms and pantries to keep edibles close at hand but neatly tucked away. Dawnvale was drafted in on this project by Market Operations director Nick Johnson after a personal recommendation by another of our clients: renowned chef patron and co-owner of Manchester House, Aiden Byrne. The Mackie Mayor building is a stark, urban space that relies on beautiful, functional pieces to make an impression. We installed bespoke distressed bullnose counter tops for a sleek finish at each of the individual stands. There’s a stunning, pared-back mix of colour and texture in the Mackie Mayor building: long, dark wood tables; distressed cream subway tiles on the counter fronts, and sleek stainless steel behind the bars. Communal tables, folding chairs and a grid of low-hanging pendant lights make the Mackie Mayor a truly functional space, juxtaposing a sense of warmth and community with the industrial, stripped-back surroundings.